Cooking on Skates: Gluten-Free Doesn't Mean Flavor-Free! Hello cookers, skaters and fans of both! I was asked by my lovely sister-in-law to contribute a bit about an up-and-coming area of cooking. For me, it's "eat-this-way-or-die" cooking... but it's becoming more popular every day, so pay attention, take notes and learn how to cook gluten-free! Gluten is the binding protein found inside many grains, such as wheat, barley and rye. It's the ingredient that works closely with yeast to help dough rise and creates that fluffy, stretchy texture we love in our breads. Because these traits are so hard to replicate with the new gluten-free baking mixes, I tend to stick with foods that are naturally gluten-free. Sometimes, the expectations I have of gluten-free baked goods only lead to disappointment and the urge to eat a real brownie in the ER waiting room. NO! Bad Heather for thinking this way! For most of my life, I've had this gluten sensitivity and simply didn't KNOW that it was causing all of my serious health problems. If you'd like to know more about my long health history, check out my recently-created blog, or ANY good blog about gluten allergies or sensitivities. You might be surprised to find out how gluten is affecting your health. 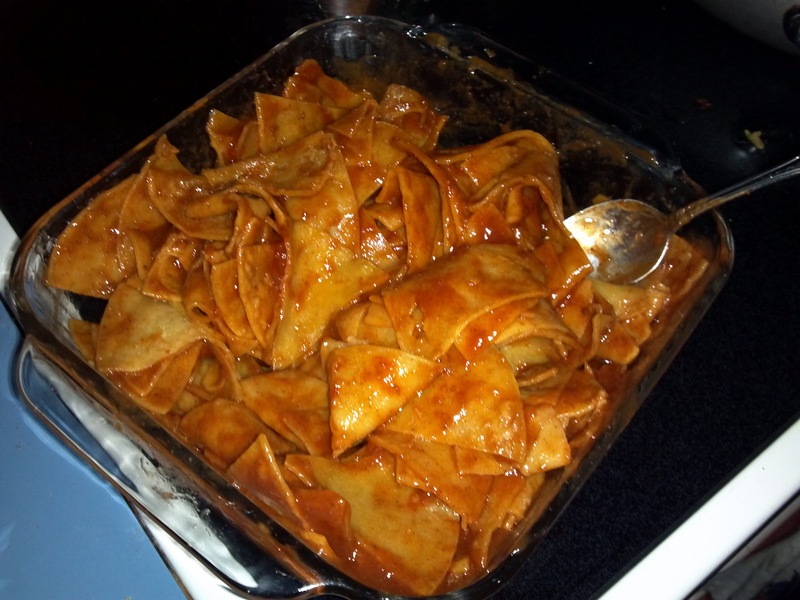 When making traditional enchiladas, you'd keep the tortillas intact for rolling. I'm trying to make an EASY version, so we'll cut out the rolling step entirely. I start by cutting my tortillas as if I were about to make chips in my fryer. You can cut them into whatever sized segments you'd prefer. 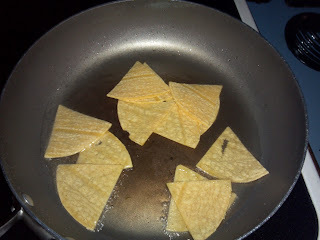 I think cutting them into sixths makes good-sized pieces for frying and stirring. 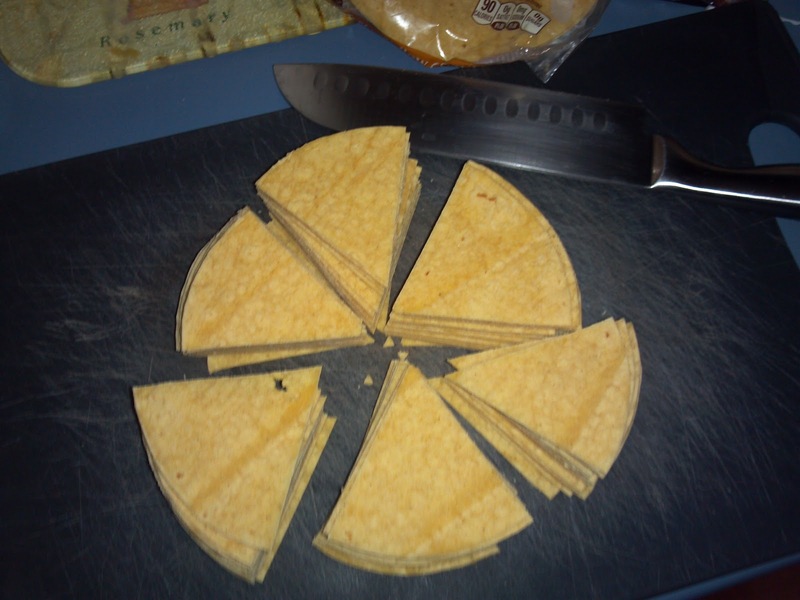 So first step, segment your tortillas. While doing this, I like to let my 1/2 cup of oil start to get hot in my frying pan. Set your burner on medium-high. 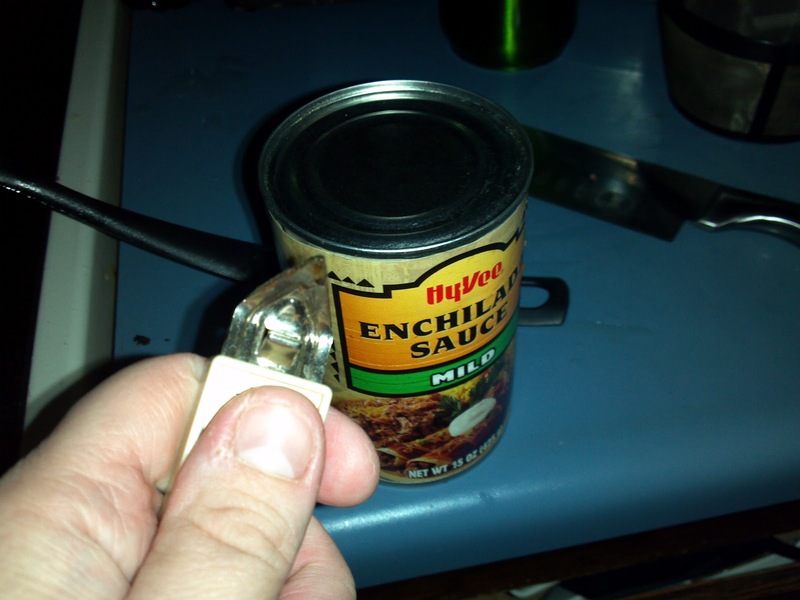 You'll know it's ready when you can let a drop of water fall into it, and it immediately sizzles into vapor. Once your oil is ready and your tortillas are cut, it's now time to lightly fry them and saturate them with oil. (Hey! I never said this was both gluten-free AND low-fat! I cut some things out and leave the others fully intact.) When I say LIGHTLY frying, I really do mean LIGHTLY. This step takes some care and attention. You can't walk away from these or YOU WILL COOK THEM TOO LONG! Toss a handful into the pan, stir them around to get them immersed in the oil a bit, and watch them. Once they start puffing up even slightly, then you know it's time for them to come out. Put onto a paper towel for draining. They will be a deeper color when fully saturated. 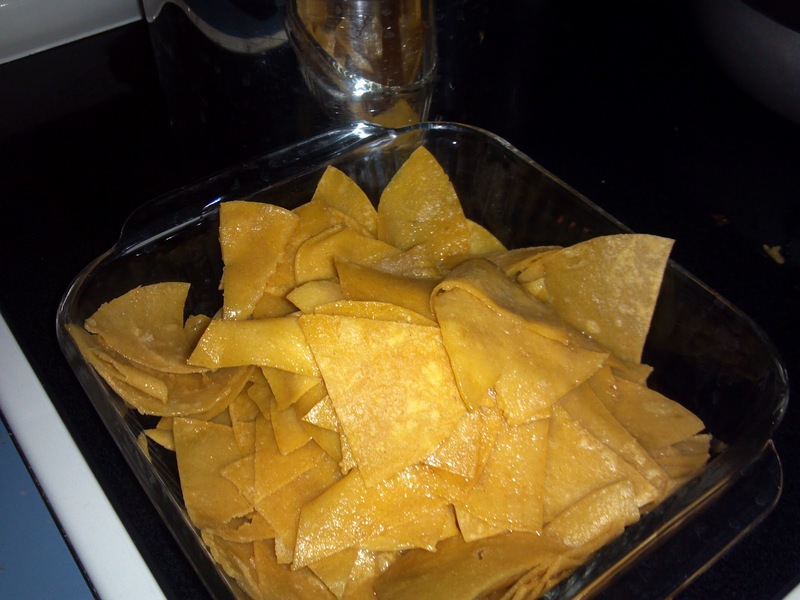 Your tortilla pieces will be floppy and soft, but the oil has done its job. For this amount, I'll only need an 8x8 glass cooking dish. If you wan to feed a large group, just double the recipe and upgrade to a 13x9 glass dish. It will just be a bit more full, but the cooking times will be the same. Whatever meat (or other protein) you choose, you can cook it how you like it. Season it the way you like it, cut it the way you like it. This is your creation, so make it to your tastes! I LOVE the entire Mrs. Dash line. 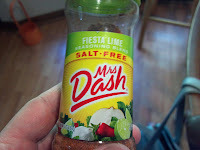 I love the Fiesta Lime seasoning for my meats in my Latin cuisine. It's just a quick blend of the spices I would probably use anyhow. Make sure to cook your meat thoroughly, regardless of the type. Everything in this dish is cooked all the way through before the final cooking step. After the meat is cooked, assemble the rest of your ingredients. 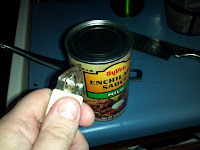 Use a church key can opener to pop holes in the sauce. It makes less mess and makes pouring a simpler step. 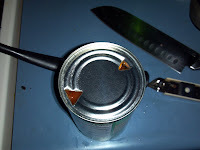 Make sure to pop two holes (one large for pouring and one small to vent). 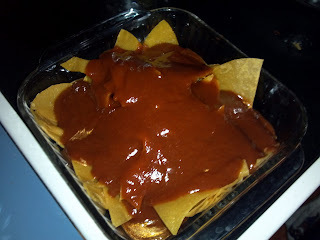 Pour the enchilada sauce over your tortillas in the glass baking dish. Stir them until thoroughly coated. 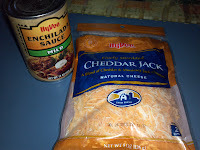 I prefer more cheese and less sauce, but if you like more sauce, wait until you've added the rest of he ingredients to add more than half of the 32 oz. can. Your tortillas should be coated as so. 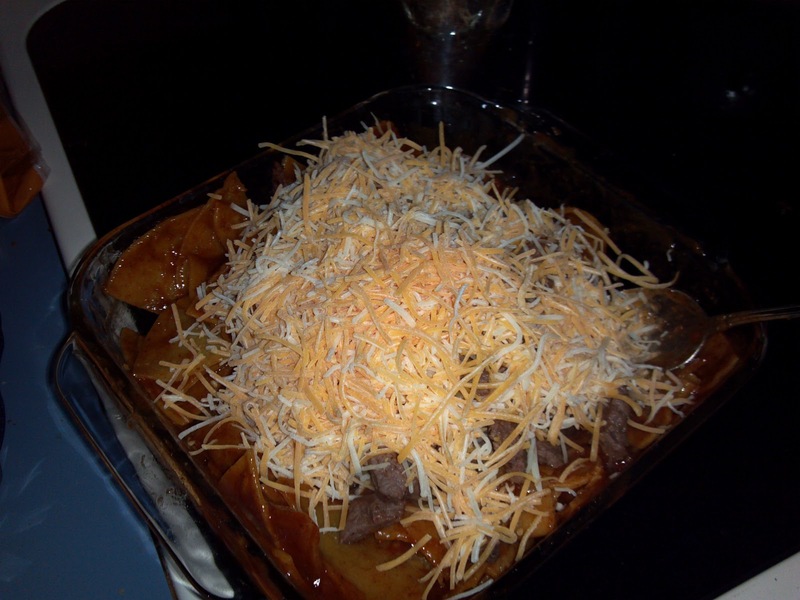 Then add all of the meat and half of the bag of cheese to the dish. Stir carefully until well-mixed. If you have more sauce to add, now is the time to add it, then stir again lightly to distribute the sauce throughout. 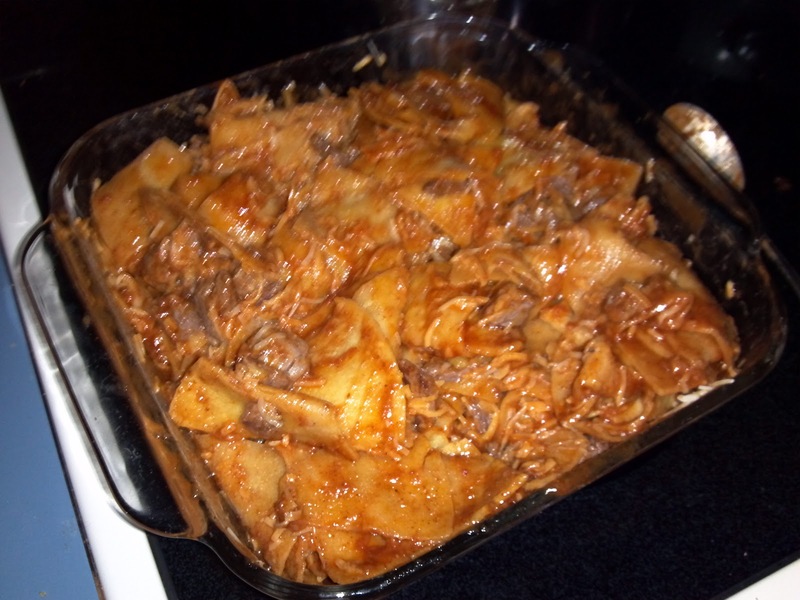 Once all of the ingredients have been mixed in, it will look similar to this. Then top with the remainder of the cheese. If you like lots of sauce, you can also dribble sauce over the top layer of cheese. 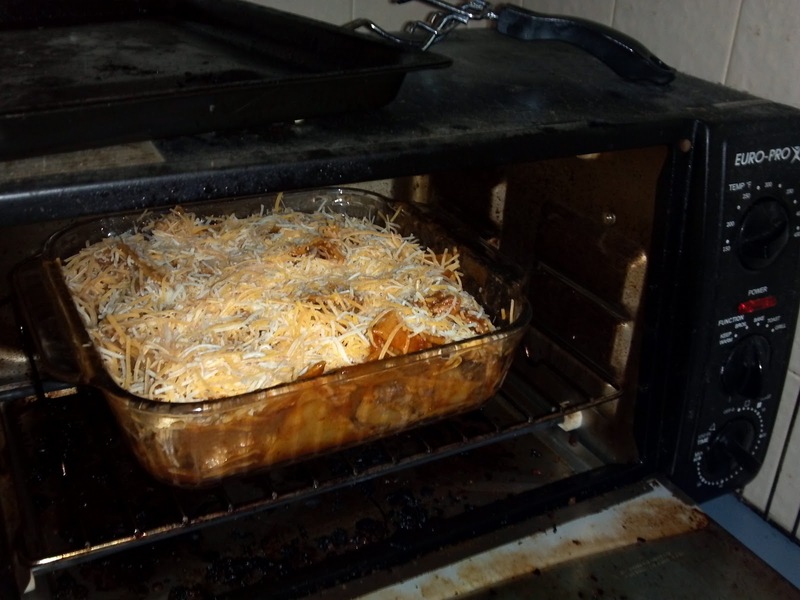 Put your assembled casserole into the oven (toaster oven in my case, since it's small enough!) for 25-30 minutes at 375. Because everything in this casserole is already cooked, you're just waiting for the sauce to cook into the tortillas and all of the cheese to melt thoroughly. Yours will look a bit different when it's done (such as not half eaten!). Sorry! 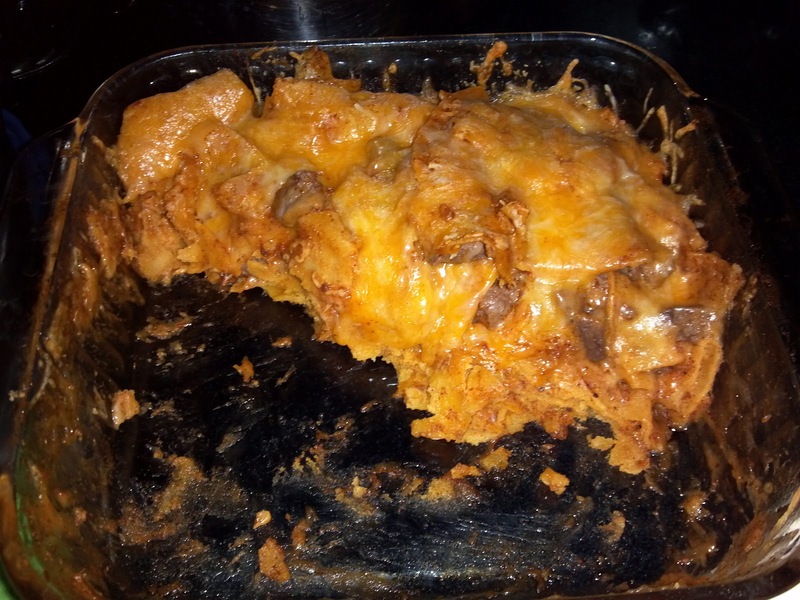 My family tore into it before I could get a good picture of the final product. I hope you've learned something about gluten-free eating, such as it's really NOT that bad!~It's a difficult lifestyle at times, but there are LOTS of great foods I CAN eat.